Robert Middleton, an English martyr was born in York, England of a Catholic family. As a young man he followed the religion of the Established Church but he stopped because of his reading and his conscience. He was also inspired by the martyrdom in York in 1586 of Margaret Clitherow, born a Middleton who was arrested for harbouring priests and inhumanly pressed to death. At eighteen, Robert left York for London. In his early twenties, he went to study at the English College in Rhiems, France and later to Seville and Rome where he was ordained to the priesthood in 1598. He returned to England shortly after his ordination and spent two years exercising his priestly ministry in Lancaster. Sometime during 1599, Fr Middleton had written to Fr Henry Garnet, superior of the English Jesuits of his request to enter the Society. In 1600, Fr Middleton was apprehended by Sir Richard Houghton together with Fr Thurstan Hunt who was one of the four men who tried to rescue Fr Middleton. They were imprisoned in Lancaster Castle although their interrogation only revealed that they were priests. When asked what they thought of Queen Elizabeth, Fr Middleton boldly replied that he acknowledged her authority in temporal matters and prayed that God would on day make her a Catholic. Both Frs Middleton and Hunt were subsequently transferred to a London prison but were sent back for trial at Lancaster. They were condemned to death because they were priests who had been ordained overseas and had dared to exercise their priesthood in England. Fr Middleton’s request to join the Society had meantime been granted by Fr General in Rome and Fr Garnet never learned whether Fr Middleton had received the letter informing him of his acceptance. Fr Hunt was hanged first before Fr Middleton on April 3, 1601 and because the latter was cut down before he was fully dead, he was also beheaded. 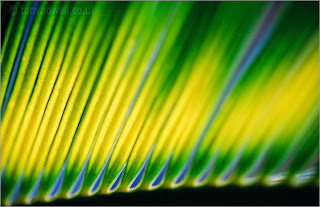 photo: palm profile by tony howell.